You need to be at least 17 to work for us. Anyone under this age is not included in the Ofsted ratios and therefore holds no responsibility for the group. Do I have to work both Breakfast and after school club? No, we can work out schedule that suits both you and us. Can I submit a CV? No, you need to complete our online application form. We are unable to accept CVs for safeguarding reasons. You will be guided through the whole recruitment process by our Recruitment Team. 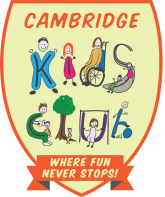 To apply for a job with Cambridge Kids Club, please check our current vacancies by selecting the “Current Vacancies” tab in the top right hand corner of our homepage. In order to satisfy our “Safer Recruiting” processes you will then be required to fill out an application form which can be found towards the bottom of this same page. You can always request an application form to be emailed over to you to fill out at your convenience. Will I always work at the same site? We try not to move staff too frequently but sometimes this is necessary. If you are unable to move sites, please let us know at interview. What do I do if I am unable to work? We do not encourage staff to take holiday during term time and appointments should be made outside of work time. All time off must be approved before you commit. If you are unwell you need to inform the co-ordinator within the approved timescale as outlined in our policies. You will be provided with a uniform consisting of polo tops. These must be worn at all times. To go with your uniform, you should wear plain dark trousers or tracksuit bottoms and suitable footwear for running around. The children go outside in all weathers, so you should ensure you are dressed appropriately. The pay cycle runs each calendar month, with your payday bing the 7th of each month. What if someone needs to contact me whilst I am at work? Once onsite, all mobile phones and smart devices need to be put away in the designated place. You are not allowed to have your phone on your person whilst working. Every site has its own mobile and you can give the number out to anyone who needs to contact you. You can check your phone and make calls with the manager’s permission and away from the children. You salary will depend very much on your experience, qualifications and role you fultil within the club. We often start playworkers on a lower wage and quickly progress them up through the ranges as they demonstrate their performance and commitment to playwork. Will there be opportunities to lead a club over time? We are always expanding and therefore we are looking for our next group of leaders.